For some five decades from 1866, when the naval battle of Lissa, when victory was secured by the Austro-Hungarian fleet over its Italian enemy by means of ramming, naval architects were to be fixated on designing ram bows into warships of all sizes. They ignored the fact that victory at Lissa was possible only because of short effective gun ranges and that this factor was soon obviated by progress in gunnery and torpedoes. The ram, as a design feature, was to prove more dangerous to friends than to enemies and there were major disasters occasioned by it. There was however one serious ramming in which disaster did not follow, as a result of prompt and efficient damage control. This instance, which involved two British Pre-Dreadnoughts, HMS Hannibal and HMS Prince George, offers interesting insights into the efficiency of the Royal Navy at the start of the 20th Century. 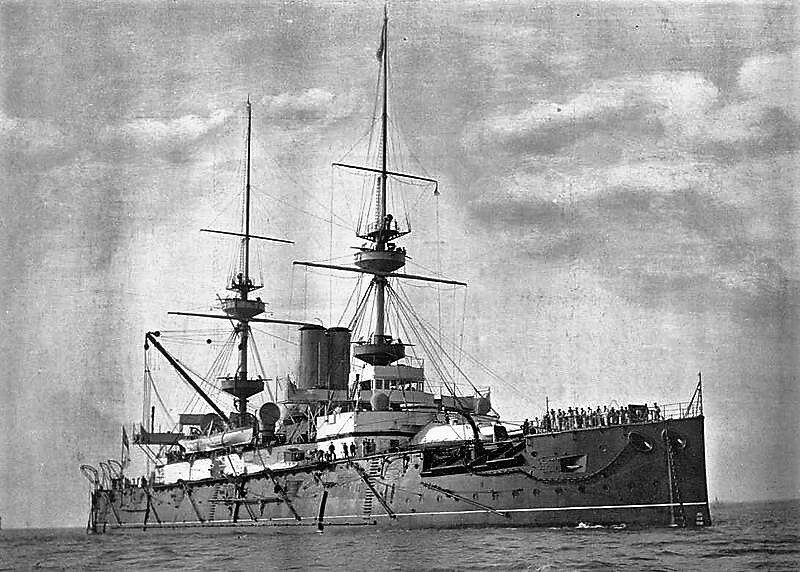 HMS Hannibal and HMS Prince George both belonged to the nine-ship Majestic class which was brought into service in the late 1890s. These 16,000-ton, 421-feet long vessels were among the most powerful afloat when first commissioned. Capable of steaming at maximum 16 knots, and with a crew of 672, they could each bring into action four 12-inch and twelve 6-inch guns as a well as many smaller weapons and five 18-inch torpedo tubes. Heavily armoured, they had one great vulnerability that would apply to all ships afloat until the invention of radar – they were blind in darkness or fog. 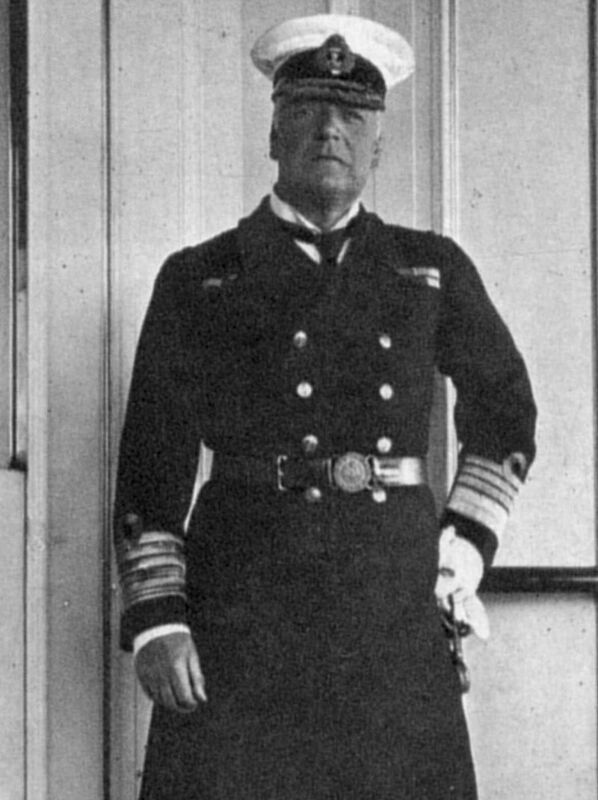 On the night of 17th October 1903 Britain’s Channel Fleet, under the command of Admiral Lord Charles Beresford (1846-1919), was engaged in manoeuvres without lights off Cape Finisterre, on teh North-Western tip of Spain. The force included both Hannibal and Prince George . The idea of such monsters manoeuvring in close proximity in near total darkness held the seeds of disaster – and so it proved. At 2130 hrs two off-duty midshipmen of the Prince George were playing cards in the ship’s gunroom, close to the stern when, without warning, the bows of the Hannibal’s bows came crashing through. Both young men escaped without injury but the damage was serious. Hannibal instantly signalled, “Have collided with the Prince George,” by flashing lights – radio had also not yet made its appearance – while measures were put in hand to assess the full extent of the damage. By 2210 hrs Prince George could signal that there was a large hole in her gun-room, and that the submerged steering compartment were full of water. Hannibal had impacted at a speed of nine knots, and had caused an 18-inch deep indentation in Prince George’s side. It was in the form of an inverted pyramid, the apex at the level of the protective steel deck, the base level with the upper deck, 24 feet in height, and over 6 feet across at the upper deck, and diminishing to a crack at the apex. In the centre of the indentation was a triangular rift, over three feet long and 18-inched wide at the top. Admiral Beresford – a controversial figure, but never one to fail to rise to a challenge – crossed to Prince George, examined into the damage and made a general signal to the Fleet to order all hand-pumps and 14 foot planks to be sent on board. Prince George’s Captain F. L. Campbell had ensured maintenance of perfect discipline. A collision mat had been placed over the injury and the crew were already working with hand-pumps and baling out with buckets. The most serious problem was however that the rudder was out of action due to the steam-lines leading to its operating mechanism being full of water. The helm was however amidships and had the rudder jammed to starboard or to port, the fine-manoeuvring that would follow later would have been impossible. The bulkheads adjoining the flooded compartments, and all horizontal water-tight doors, were shored up with baulks of timber. Water was still entering however because, owing to the indentation in the side of the ship, the collision mat did not fit tightly. 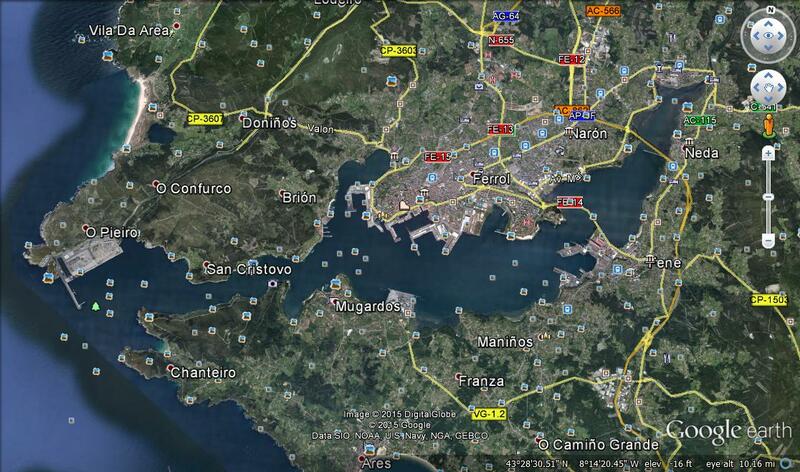 Beresford ordered the fleet to proceed to the nearby Spanish naval base of Ferrol. This lay about half-way up a narrow ten-mile inlet which was known for sunken rock hazards. 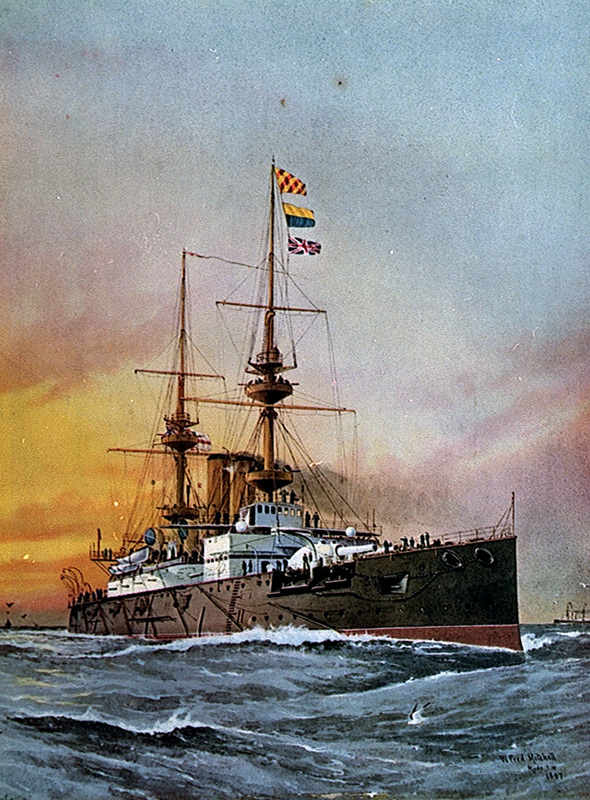 An earlier British battleship, HMS Howe, had gone aground there in 1892 and had been rescued only with difficulty, and three lesser ships had suffered the same indignity thereafter. Beresford was taking no chances and he sent a vessel ahead to mark known rocks by buoy. A message was also conveyed to the Spanish authorities to explain the situation. Captain Campbell of the Prince George was now responsible for a very impressive piece of seamanship. He brought the ship up the tortuous channel to Ferrol harbour, without benefit of a rudder and steered by engines alone. This involved proceeding a slow speed, sometimes with both screws ahead, sometimes astern, sometimes one ahead and the other in reverse, according to which way it was necessary to turn his ship’s head. His handling was faultless, despite the fact that during these operations Prince George was heavily down by the stern, drawing 25 feet forward and 34 feet aft. Her stern walk was flush with the water. Prince George arrived in Ferrol harbour on 18th October. Divers and working parties were sent to her from all the other ships, and the Spanish Government made dockyard resources available. The working parties laboured day and night for the next five days. 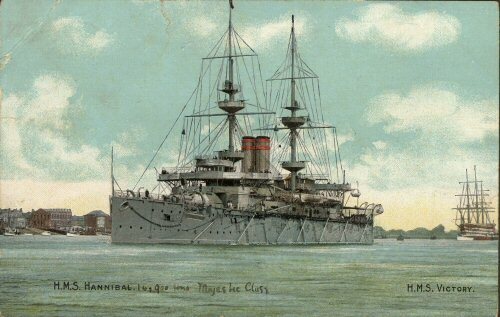 On 19th October the armoured cruiser HMS Hogue, was placed alongside the Prince George to make her salvage pumps available. In parallel with this a cofferdam was being constructed against the side of the ship, around the rupture. This was a formed a chamber “which was filled up with all sorts of absorbent and other material, such as seamen’s beds, blankets, rope, hammocks, pieces of collision mats, gymnasium mattresses, cushions, biscuit tins, etc. Thus the coffer-dam formed a block, part absorbent and part solid, wedged and shored over the site of the injury.” Beresford also recorded that the work involved 24 engine-room artificers, 24 stokers, 88 carpenter ratings, 27 divers and 16 diver-attendants. By 1903 a ship’s “carpenter” was no longer concerned with maintenance of wooden structures but with the ship’s steel framework and plating. The divers were drawn from all ships in the fleet and they, like the other staff involved, operated on a three-watch system so that the work proceeded night and day. While this was in progress over 145 tons of ammunition and stores were shifted in order to trim the ship. The total cost of the stores purchased locally at Ferrol was £116. 2s. 4d – one can only be impressed by the exactitude of the two shillings and four pence! On 24th October, just one week after the collision, Prince George departed Ferrol for Portsmouth, escorted by the armoured cruiser HMS Sutlej. The integrity of the cofferdam was attested by the fact that despite rough weather being encountered the total amount of water shipped during the voyage was estimated at one gallon. Once repaired at Portsmouth Prince George was soon back in service. 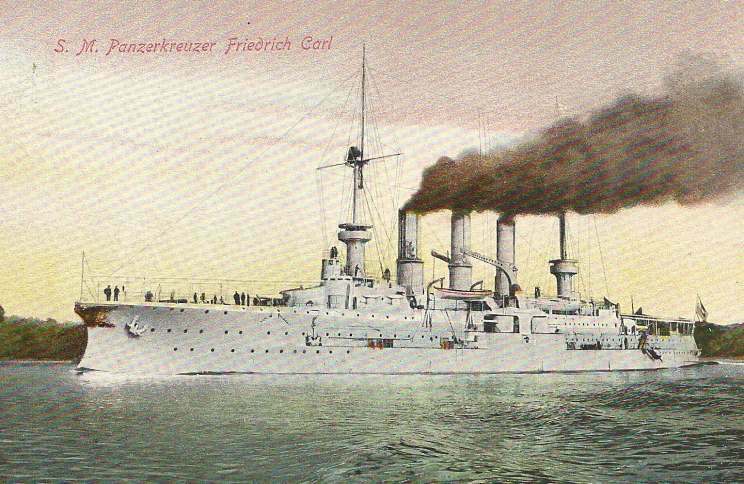 She seems to have been accident-prone as she suffered minor damage in another collision, this time with the German armoured cruiser SMS Frederick Carl at Gibraltar in 1905. She also suffered moderate damage in 1907 when she broke free from her anchorage at Portsmouth and struck the new armoured cruiser HMS Shannon. She was to prove lucky however in WW1 when she survived hits by Turkish shells at the Dardanelles and by a torpedo which failed to explode. Pieces of her still exist – she was sold to a German firm for scrap in 1921 but broke free from her tow and ran ashore off Kamperduin, on the Dutch coast. Firmly aground, she was stripped of valuable material and left in place as a breakwater of which glimpses can still be seen at low tide. And the villain of the piece – HMS Hannibal? Judged to be useless in 1915, she was disarmed – her guns were placed on newly-built monitors – and she thereafter had a dull but worth career as a trooper and depot ship. She was scrapped in 1920. Do you want to read about the amazing Charles Beresford at an earlier stage in his spectacular career? 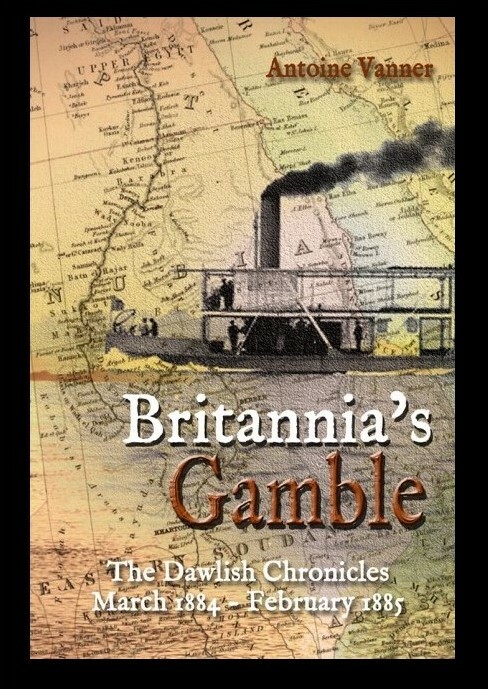 You’ll meet him in Britannia’s Gamble, when Nicholas Dawlish encounters him during the 1884-85 Gordon Relief Expedition. Beresford’s real-life role made him a national hero and laid the foundation for his advancement to high command. Click on the cover image to learn more about Britannia’s Gamble. It’s available in Paperback and Kindle formats and if you’re a Kindle Unlimited subscriber you can read it at no extra cost.